We are a leading Manufacturer of positive displacement pumps from Chennai, India. 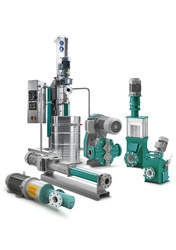 NETZSCH Pumps and Systems are the Leading manufacturer of Positive Displacement Pumps. The Positive Displacement Pump principle is ideal for handling slurries, viscous, shear sensitive or two/tri phase mixtures or when applications require, significant suction lift capabilities.